Snow clogs the streets on North Bucknell Street in the Fairmount section of Philadelphia in this file photo. 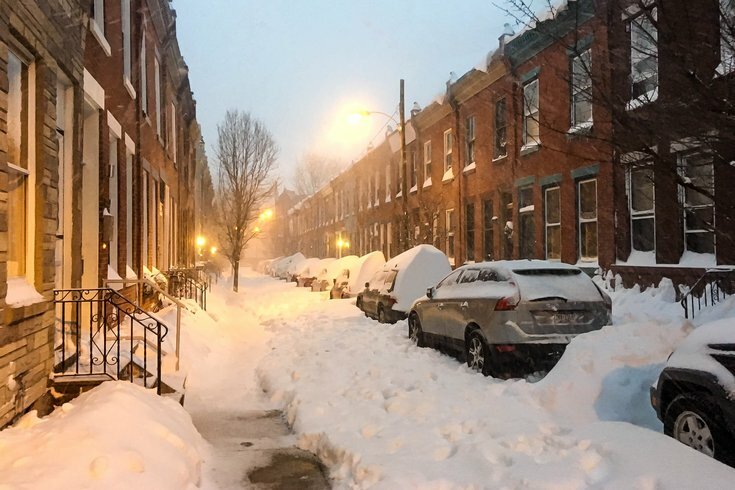 Forecasters are boosting snow accumulation estimates as the second nor'easter in five days looks to hit the Philadelphia region in the next 30 hours. The storm looks to have a major impact on a region still recovering from the weekend storm. In fact, more than 41,000 PECO customers remain without power on Monday afternoon. 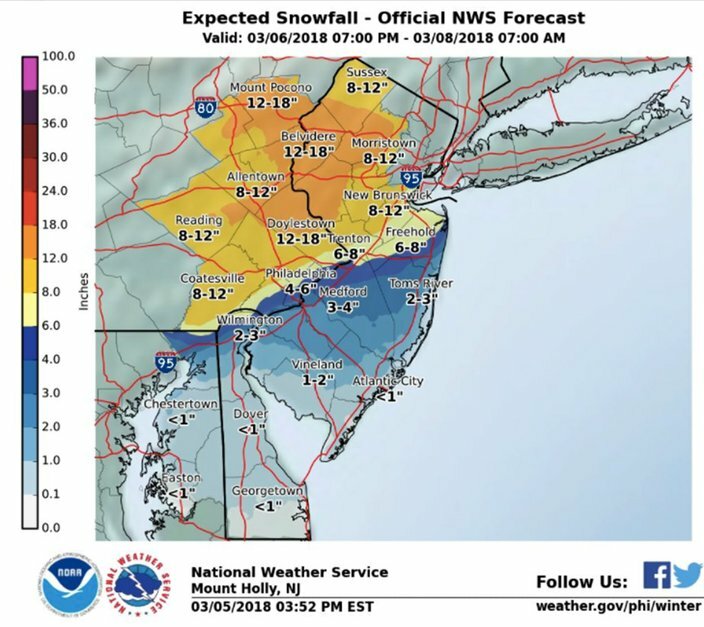 A winter storm watch is in effect from Tuesday evening through overnight Thursday for the entire Philadelphia region, according to the National Weather Service. Between 4 and 18 inches of snow are expected, with the higher accumulations generally expected west and northwest of the I-95 corridor, forecasters said. The snow likely will be heavy and wet along I-95 and points southeast. To the north, snowfall rates may approach 2 inches per hour, particularly in the Lehigh Valley and Southern Poconos. About 2-3 inches of snow is expected in South Jersey and less at the Jersey Shore. The storm will be accompanied by strong winds, though not as powerful as the winds that toppled thousands of trees and power lines across the region on Friday and Saturday. Sustained wind speeds are expected to increase to about 15 to 25 mph, with gusts of 30 to 40 mph possible. Still, additional tree damage and power outages are possible, which would impact recovery efforts. The precipitation should start as rain – probably late Tuesday night – as it moves in from the west, but increasingly cold air will likely support the changeover to snow, though exactly when that happens is a bit up in the air. As a result, snow totals remain subject to adjustment, forecasters said. Snow perhaps could be at its heaviest in the region during the Wednesday evening rush hour, forecasters warned. Motorists should expect difficult travel conditions due to snow-covered roads and reduced visibility in many parts of the region. Heavy wet snow may bring down tree limbs and utility wires, resulting in some power outages. Looking ahead, another area of low pressure is forecast to move eastward to the Middle Atlantic coast on Sunday. Another round of precipitation is possible, though it currently looks to be mainly rain in the Philadelphia are with a wintry mix up north. Monday night: Mostly clear, with a low around 31. North wind 5 to 8 mph. Tuesday: Increasing clouds, with a high near 46. North wind around 5 mph becoming light and variable. Tuesday night: Rain likely before 10 p.m., then rain and snow likely between 10 p.m. and 4 a.m., then snow likely. Cloudy, with a low around 33. Southeast wind 6 to 9 mph. Chance of precipitation is 70 percent. New snow accumulation of less than one inch possible. Wednesday: Snow before 10 a.m., then rain and snow. High near 37. Breezy, with an east wind 11 to 20 mph becoming north in the afternoon. Chance of precipitation is 90 percent. New snow accumulation of 2 to 4 inches possible. Wednesday night: Rain and snow before 10 p.m., then a chance of snow. Mostly cloudy, with a low around 32. Chance of precipitation is 80 percent. New precipitation amounts of 1-2 inches possible. Sunday: A chance of rain and snow. Partly sunny, with a high near 46. Chance of precipitation is 40 percent.